Prominent & Leading Manufacturer from Mumbai, we offer bridal gown embroidery and bridal gown beads embroidery work. We are offering an excellent range of Bridal Gown Embroidered Hand Work to our revered clients. These gowns have been made using finest quality material of pastel silver colors and have intricate silver beads embroidery. This bridal gown have been made of 168 cm of front length and back length with train 60 cm. We can also negotiate of this. Our customized range and competitive prices make us leading name in this domain. These include various wavy patterns that are created by interlacing colored beads for enhancing the charm and elegance of the fabrics. Our customers value these for their sophisticated and attractive looks. Bridal Gown Beaded Embroidery Work. 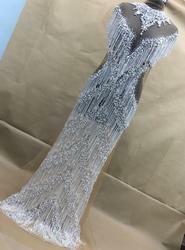 We are offering an excellent range of Bridal Gown Beaded Embroidered Hand Work to our revered clients. These gowns have been made using finest quality material of pastel silver colors and have intricate silver beads embroidery. This bridal gown have been made of 168 cm of front length and back length with train 60 cm. We can also negotiate of this. Our customized range and competitive prices make us leading name in this domain. These include various wavy patterns that are created by interlacing colored beads for enhancing the charm and elegance of the fabrics. Our customers value these for their sophisticated and attractive looks.